Web sites, collaboration, document management, paperless offices―we want it all in business today, but how do we achieve all of these goals? More importantly, if you work for one of the millions of small-to-medium-sized businesses, how do you find the time to build the expertise necessary to reach these goals? Even the most powerful tool will not allow you to succeed unless you can get the majority of your staff to use it efficiently and effectively. You need a guide that demonstrates a platform that small-to-medium-sized businesses can use to reach these goals. 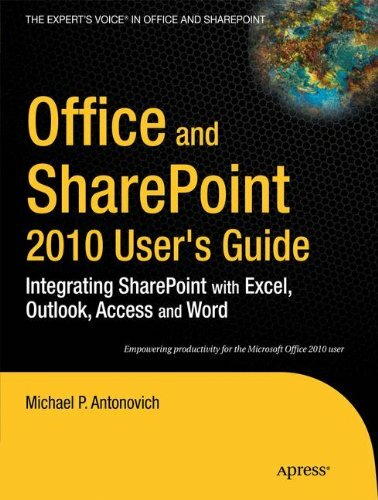 Office and SharePoint 2010 User’s Guide demystifies the path that every Microsoft Office user can follow to benefit from the synergism of tools they are already familiar with. Together with SharePoint 2010, users can achieve goals like web sites with a consistent single view, improved collaboration within their organization, and better document management, and may even get one step closer to the paperless office we’ve been promised for years. This book has topics for Office users of all skill levels, from those just starting to use Office tools to experienced power users. It examines each major Office tool and shows how it contributes to the support and use of SharePoint in today’s increasingly electronic-based office environment.